When math makes sense, kids leap way ahead – whether they started far behind or already ahead in math. Our formula for teaching kids math, the Mathnasium Method™ has transformed the way kids learn math for over a decade across 500+ centres in the US and Canada. Our time-tested approach is successful in large part because it strongly focuses on the two major components of education: content and delivery. In order to teach kids math the way that makes sense to them, our specially trained tutors must have ample instructional materials, like our proprietary extensive curriculum, (content) and multiple teaching techniques (delivery) in order to meet each student’s unique needs. Not only do we know how to teach your child, but we also think math is exciting, fun, and interesting! 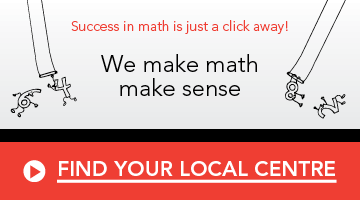 Our specially trained math tutors make all the difference – they’re great at math and great with kids. They will teach your child how to understand math in an individual setting; our unique approach enables us to explain concepts really well and lend a helping hand to every student. Our tutors foster a caring, encouraging environment that helps kids thrive and learn! See how our Method works!